I'd like to introduce you all to one of our boys. The smaller one, the tougher one, the neurotic one, the bossy one, and the one who thinks he might be a person. Yep, they're all the same guy. He's a mafioso, he's a singer, he's a velcro dog, and when you give him a head massage he yawns and scratches himself in slow motion. We love the little guy. 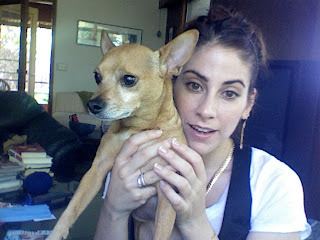 And here he is, in his first guest modeling appearance on this blog.....Milo!!! Wow! That is the cutest photo I've seen in a long time! Stunning! The dog's cute too.